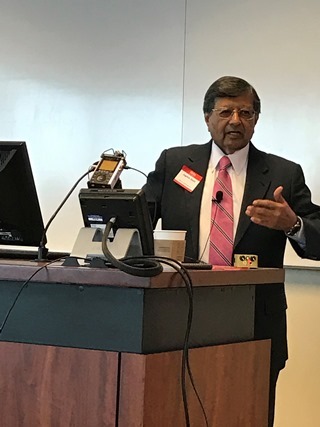 The J. Mack Robinson College of Business of Georgia State University and Global Indian Business Council (GIBC), in association with Consulate General of India–Atlanta, co-hosted a one-day conference on Friday March 17, 2017 at GSU’s Buckhead campus. An ambitious road map was laid for 2017 by well-known speakers from universities, business, and nonprofit organizations, who aimed to integrate several fields to fuel the project of lighting up the life of the Indian rural community that wakes up every morning without proper energy resources. Rural energy independence is the crucial enabler leading to clean water and air, nonagricultural employment, and reversing urban migration. It demands coordinated efforts in skill development, basic education, local buy-in, testbed development, and research. Where end users cannot buy or operate the systems ahead of economic advancement, innovative avenues synergize NGOs, microcredit, corporate and university resources, and public policy. Dan Bello briefly shared the history of Georgia State University and business school, and Sushil Nifadkar of GSU’s faculty of International Business welcomed attendees—from several US states, India, and Africa—and emphasized the role of international business. Mr. Dhiru Shah, GIBC President-Elect, shared the vision of the organization, founded in 2014 to facilitate business exchanges between India and other nations, primarily the USA. Its offices are in Atlanta, Boston, Ahmedabad, and New Delhi. 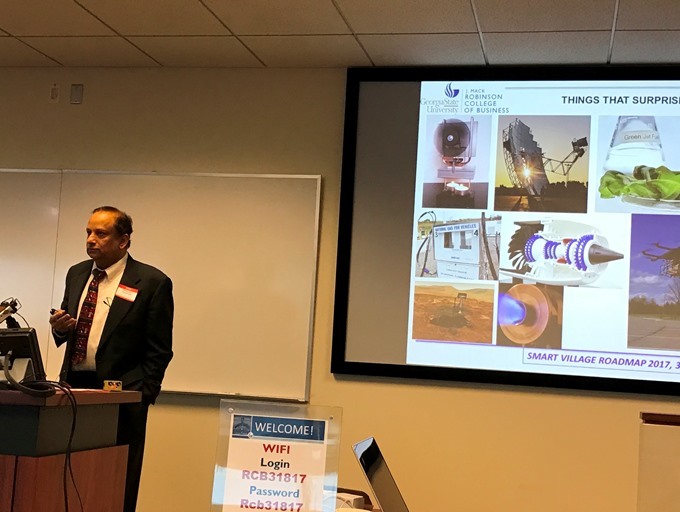 Consul General Nagesh Singh then spoke with passion about the tremendous advances made in India in recent years, and the tremendous challenges that lie ahead. Over 200 million people have risen out of poverty, but many more remain. The nation aims to reach over 175 gigawatts of power generation, yet the need for last-mile connectivity and grassroots access to energy remains most urgent and requires innovative thinking. He encouraged participants to come up with solutions, keeping in mind the special challenges the Indian government faces. Dr. Narayanan Komerath of Aerospace Engineering, Georgia Tech, and Joint Secretary, GIBC laid the “Roadmap to Rural Energy Independence.” He presented solar energy projects to generate energy sufficient for one household—both economics behind the projects and plans to spread the efforts. He emphasized the need for all sectors to work together to implement the solutions provided by scientists. It requires business people, NGOs, skilled workers, administrative officers, diplomats, and public-private partnerships to work together to bring about energy self-reliance. Dr. Jane Davidson, Christenson Chair in Renewable Energy and Professor of Mechanical Engineering, U. Minnesota, explained thermochemical fuel production using intensified sunlight. Prairie grass feedstock can be converted to syngas, and thence to many types of liquid hydrocarbon fuel using this process. While scaling up to compete in the US petroleum marketplace is difficult, the size reached is already appropriate for adaptation to Indian villages. Several businesspeople expressed interest in learning more about this technology. Sarah Hillware, World Bank communication specialist, emphasized the importance of empowering women in bringing revolutionary change at the village level all over the world. She cited her experience with advancing the education and empowerment of women in the US and in Kenya in areas of health and hygiene, microfinance entrepreneurship, and technology acceptance. Dr. Bala Ganesh and Gautam Mattey of UPS provided a fascinating glimpse into logistics, “connecting 660,000 PIN codes” all over rural India. Modern technology such as robotic land vehicles and drone aircraft are already being tested, to deliver crucial supplies swiftly across intractable terrain. These offer intriguing solutions to the massive problems of infrastructure in rural India. Dr. Rajendra Singh, D. Houser Banks Professor of Electrical and Computer Engineering, Clemson University, South Carolina, presented opportunities with solar photovoltaic (PV) cell ‘Nearly free infinite power.’ He argued at length about the exclusive potential of PV power generation, since it will continually come down in price and improve in capability, like computers. Professor Vijay Madisetti of Georgia Tech gave a succinct and authoritative overview of the fast-evolving Internet of Things (IoT) and the associated BlockChain technologies for transparent, reliable peer-to-peer transactions. He explained the relative merits of competing technologies to measure and maintain the performance of distributed energy systems, as well as enabling customers to interact with such systems with minimal transaction cost or complexity. Professor Jagdish Sheth of Emory University gave a fascinating insight into Corporate Social Responsibility (CSR). Indian businesses are obliged by law to use 2 percent of their net earnings in projects of their choosing that benefit society, in categories identified by Government of India. Rural energy independence provides mid-level, small and particularly, family-run corporations in smaller towns with an excellent vehicle for CSR resources. Over $4B is available annually for such uses. Now is the time to pool resources, technology, and talents to bring about the change to help an ordinary person to become extraordinary. 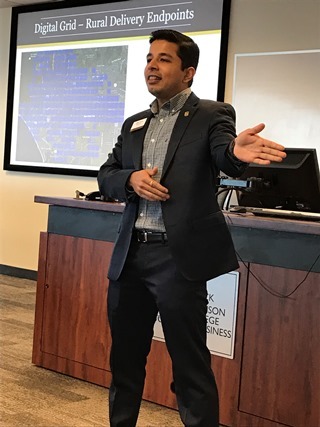 Dr. Sheth spoke with passion about the importance of providing opportunity to rural residents, citing himself as an example. Dr. Sumesh Arora, Director of Energy and Natural Resources Division, Mississippi Development Authority, described the similarities, solutions, and relevance in issues faced in Mississippi to those in India. A team presentation by Dr. Vijay Vemulapalli, Mr. Malla Reddy, and Mrs. Manjula Reddy discussed their experience of the VIBHA and Ekal Vidyalaya NGOs in providing grassroots education and support, particularly in the tribal villages of India. Dr. Vemulapalli discussed VIBHA’s work with children. Mr. Reddy explained the Training Workers in Industry (TWI) processes that were developed during World War II in the USA when the workforce included millions of women and older workers who had to be trained rapidly. These techniques were adopted by Japanese and German industry after the war to improve productivity and product quality. Mrs. Reddy discussed the realities seen during her visits to tribal schools run by the Ekal Vidyalayas. Dhiru Shah set India’s problems in historical context, pointing to the rich heritage of rural industry, education, and trade that flourished in pre-Colonial times. Today fragmentation of agricultural land and lack of opportunity keep villages in poverty. He pointed to the primacy of education and skill development in reviving the villages, and the need for energy to accomplish these goals. A panel discussion closed out the conference. Dr. R. Natarajan of Vellore Institute of Technology (VIT), Tamil Nadu, India, spoke of how VIT has adopted several villages, their students providing assistance and mentoring to villagers. The institution provides full scholarships to village youth who perform well in the engineering entrance examinations, and special assistance if needed to level the fields of opportunity with their urban classmates. Prof. Natarajan provided eye-opening examples of VIT’s research efforts in various areas, including wind energy. Mr. Ashwin Patel of GIBC related his experiences in developing and bringing to market an efficient cookstove or choolha, which has now been accepted by the World Bank for use in rural communities. He is also developing a solution for urban waste, extracting syngas from it and generating fertilizer from the residue. He cited his experience of how school systems in India can be improved through effective intervention. Mr. Gautam Mattey further discussed the role of technological solutions in leap frogging logistics and infrastructure difficulties in India, answering audience questions about the role and deployment of aerial and terrestrial robots. Several participants spoke to the media about their experiences, their strong personal desire to see energy independence brought to rural India, and the next steps towards that goal. For detailed PPT presentations, see globindian.org/SMARTVILLAGEROADMAP2017.html. Sponsors included SOFTPATH System, SEWA International, AMRUTH Ayurveda, Global Technologies, Asian American Store Owners Association, Ekal Vidyalaya Foundation, Global Mall, SCV Inc, and SURAJ International.